Spring is about sprung. There are still parts of the United States getting snow, but lets face it Spring will be quick around the corner. And because its coming up so quickly let me give you some ideas for your colors. You can honestly do any color you want, something you always wanted or your favorites. 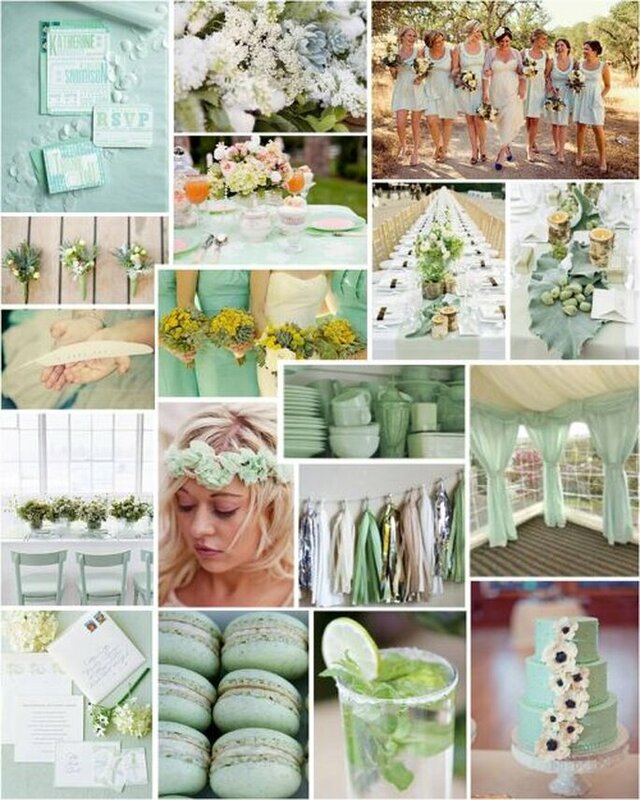 There is always a trending theme when it comes to weddings. Today we will talk about colors!! Take a quick look at this picture; beautiful colors and so different. You can use the Greyed Jade with the African Violet or I like even the Lemon Zest with the Monaco Blue would be a cute pair! Or take any of these colors and pair them with ivory or gray for a soft look. Ideas are really endless…. Pick something that will brighten the venue and maybe give it a romantic look. You always have the option of doing three or four colors as well. You don’t have to limit it to two. Be creative. This is the best day of your life girls! Okay, so say your favorite color is purple. You can always do three shades of purple to make the decor a little more unique. Like what this bride did. Be creative. Let the color juices flow! This picture brought to you by Zankyouweddings. In this picture there is so much shown here. The color is Jade and the theme is the 1920’s! This theme is always popular for weddings and is always classic. I just love how they imcorporated the color Jade in to every part of their wedding. And it reminds us of “The Great Gabsy” colors. Defintely unique but shows off their style throuhout their day. If you need more suggestions you can check out our Pinterest page!! Happy Planning! well this is kinda nice love the mint.